A member of Wofford’s class of 1909, Thomas Carlisle Montgomery came to Wofford from Marion, South Carolina. He was a member of Kappa Alpha and the Calhoun Literary Society. 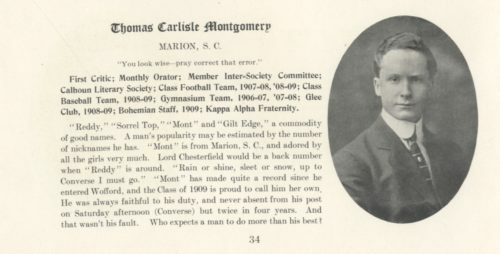 His father, W. J. Montgomery, was a member of the Class of 1875. Following his graduation, he served in the Allied Expeditionary Forces during World War I. Recently, one of his family members shared a link to a collection of letters that T. C. Montgomery wrote home to his mother during the war. He’s posting letters 100 years after they were originally written. He let me share the link here, and I hope others will enjoy seeing what a Wofford alum wrote home during the First World War. We have a World War One: At Home and Abroad exhibit underway in the library gallery this fall, also recognizing the centennial of American involvement in the war and its impact on the Wofford campus.